You are here: Home / Search for "signatures"
The United States Postal Service (USPS) has approved new 2015 postal rates that begin Sunday, May 31, 2015. The 2015 cost of sending a 1-ounce USPS Certified Mail letter with Return Receipt (old fashioned green card) will cost $6.74. If you send Certified Mail using Electronic Delivery Confirmation the cost is $4.69. Each additional OZ of First Class mail will cost $0.22 per OZ. 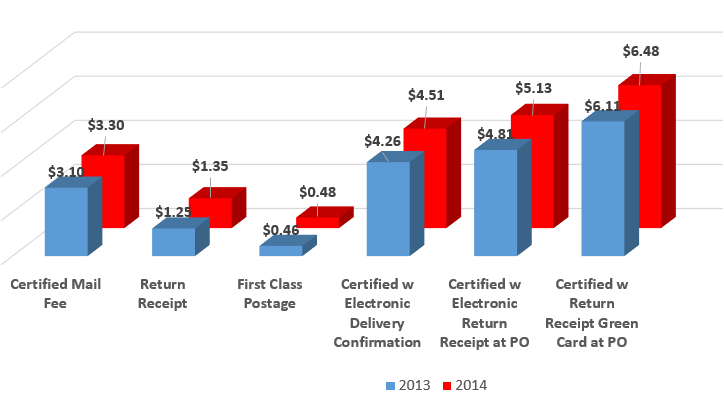 In summary, USPS Certified Mail postal rates increase +6.5.%, Return Receipt costs increase +7.5% and First Class postage will increase two cents or +4%. How to Reduce USPS Certified Mail Costs? You can reduce Certified Mail rates by using web sites like Certified Mail Labels that dispense USPS PC Postage Online with Electronic Delivery Confirmation and Return Receipt Signatures. Many mailers replace old fashioned green cards with the improved electronic proof of delivery receipts. The electronic receipts can be shared by email or downloaded by FTP as PDF files to provide proof of mailing. Each report displays the postmark, who the letter was addressed to, USPS in-route letter tracking and the final proof of delivery. The web site even allows you to upload a letter in as an electronic PDF file and they print it and mail it the same business day. Skip the trip to the Post Office and save time and money. Online services reduce costs. eliminate forms, labels, and monthly service fees. Skip the trip to the Post Office! Saves time and money. You can sign-up for a free account at Certified Mail Labels. No monthly fees or contracts. Just pay when you mail. See how fast and easy it can be to address and send USPS Certified Mail. Certified Mail Envelopes provides the USPS approved Envelopes with free online web access to address, track and print your mailings. You can log in to the web site to print USPS delivery reports and can access your account 24/7. Your online web account stores all your Electronic Return Receipts safely for 10 years. 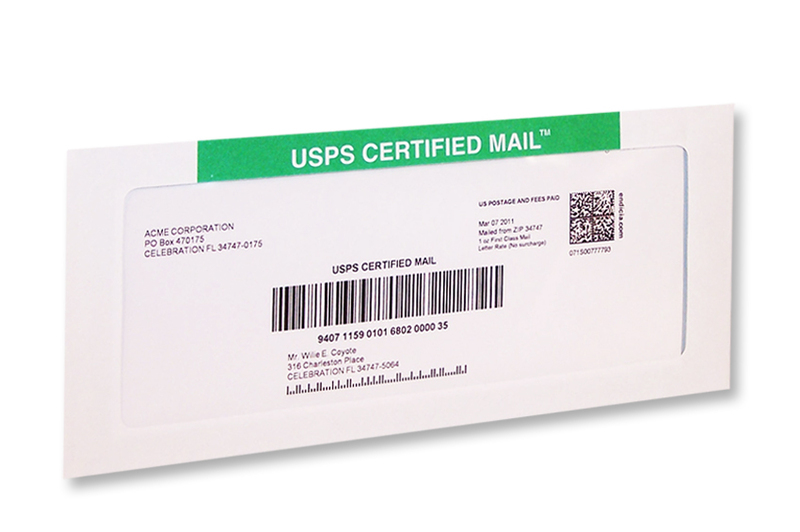 USPS has pre-approved Certified Mail Envelopes so the process is fast and easy to use. No monthly fees or hidden costs. Just pay as you mail! Use the Free Account Sign-Up now to get started. 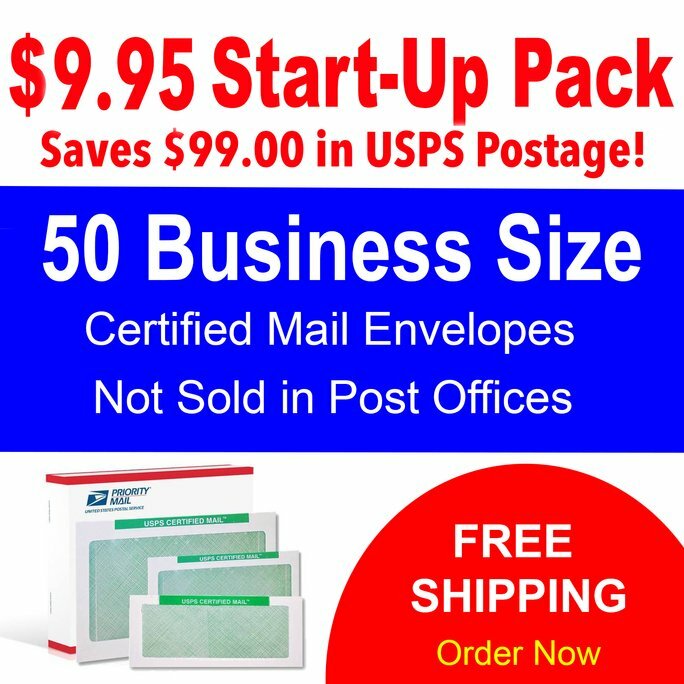 We will send you a start-up kit including 2 free envelopes. The service includes the USPS SCAN Form 5630 or mail manifest form USPS PS-3800 to provide legal proof of acceptance into the United States Postal Service letter stream. You also get in-route letter and delivery tracking plus the final USPS delivery confirmation by email. The Return Receipt Electronic is provided as a PDF file for each letter you mail. Today many mailers use the electronic return receipt to replace the old-fashioned green cards return receipts. You get proof with Certified Mail Envelopes. Proof of Mailing and Proof of Delivery from the United States Postal Service (USPS). Our Certified Mail Envelopes are available in three sizes, #10 business envelope, 6 X 9″ Booklet and a large 9 X 12″ Flat sized envelope all approved by USPS. We provide online web access to address and print Intelligent Mail Barcode (IMB) and the Certified Mail bar codes with tracking information. Electronic Return Receipt to show proof of delivery are included with each mailing, plus ‘in-route’ letter tracking and the final delivery confirmation for each letter. You can even download a PDF of the Return Receipt Signature if needed. You may track each letter ‘in-route’ to insure delivery. No labels or stickers are used in this automation process. Just log in to the website to address then print an address sheet with tracking bar codes. Slide the address sheet into the window envelope that has been USPS approved for Certified Mail Envelope with your letters, apply USPS postage and drop the envelope into the USPS mail stream. It’s that fast and easy. Mailers may use Forever Stamps to help ease the transition during price changes. Forever Stamps do not have a denomination and will be honored for First Class Mail whenever they are used for a one-ounce letter mailing. USPS Certified Mail Return Receipt Requested service can be purchased before or after your mailing. The old-fashioned green card Return Receipt now cost $2.80. For additional information call Certified Mail Envelopes 800-406-1792. Frequently Asked Questions about USPS Certified Mail tracking, rates, and delivery information. • How much postage do I need to put on my Certified Mail® Envelope? • How long does it take for USPS to deliver a Certified Letter? • How can I track my letter? • Can I send a Certified Mail® letter to Canada? • Can you mail a Certified Mail® letter to a PO Box? • What is Electronic Delivery Confirmation? • What happened to the old fashioned Green Card? • How much postage do I need to put on my Certified Mail®Envelope? $6.59 is the cost of a 1 oz. USPS Certified Mail® letter with old fashion green card Return Receipt Requested. Add $0.21 for each additional oz of postage (approximately 5 pages of paper per oz). The $6.59 cost breaks out like this: $3.35 for the Certified Mail fee +$2.75 for the green card Return Receipt + $0.49 for the First Class postage (1 OZ.) If you purchase your Certified Mail postage online or through a Postage Meter the rates will be lower. If you use Electronic Return Receipt Signature the cost is $1.45 this will replace the $2.75 green card return receipt cost. • How long does it take USPS to deliver a Certified Letter? Plan on 3 to 5 business days for a USPS Certified Mail® letter mailed with First Class postage to be delivery. You can expedite delivery by upgrading to USPS Certified Mail® with Priority Mail Delivery. This provides 2 or 3-day delivery service. USPS Certified Mail® provides the sender ‘proof of mailing’ and ‘proof of letter delivery’ it was not designed to be the fastest form of mail, but is used to provide ‘proof’ and meet compliance and regulatory requirements for important notifications. USPS Certified Mail® is considered Special Service mail so it does receive high priority delivery service. Remember someone must be available to sign for each USPS Certified letter. If you are mailing to a residential address and no one is home, a delivery reminder slip will be left in the mailbox by the letter carrier. This reminder informs the person a USPS Certified Mail® letter is being held at the local Post Office for pick-up. They must go to the Post Office to Sign for the letter and pick it up. If no one picks up the letter after 5 to 7 days, USPS will leave a second delivery notice. Again the delivery slip reminder is left by the letter carrier. Finally, after 5 to 7 days the final delivery attempt is made to the delivery address. After the final notice reminder is left the letter is taken back to the Post Office and held for 5 to 7 days prior to being returned to sender with USPS proof of the various attempts of delivery and notification. This entire time frame can take 17 to 21 days if no one claims the letter. Who do I call if I have questions about my USPS letter delivery? The USPS Help Line is 800-275-8777 or you can visit the USPS web site www.usps.com. If you are using the old fashioned green card USPS forms you will not receive email notification of your letters delivery. If the green card is lost, you will need to provide a copy of your mail receipt to have the old fashioned green card replaced. If it has been more than 3 weeks and you see no attempted delivery information reported the best place to call is the local USPS Post Office that is responsible for the letters final letter delivery. In other words, the Post Office closest to the final delivery address Zip Code. To locate this information call USPS and request the name of the Post Office responsible for mail delivery at the final delivery address you may need to provide them the Zip Code. What Happen To The ‘Green’ Return Receipt Cards? The Green Card Return Receipt has been the icon of Certified Mail since 1955. This little Green Card has been difficult for both the sender and the U.S. Postal Service to manage and store. In July 2001, the U.S. Postal Service began providing Electronic delivery confirmation available in a PDF file that provides proof of letter delivery. This information is collected and authored by The United States Postal Service USPS and provides the sender ‘proof of letter delivery’ for USPS Certified Mail. Return Receipt Electronic™ provides USPS delivery confirmation for USPS Certified Mail® delivery by the United States Postal Service. Many mailers are using the RRE -Return Receipt Electronic™ to replace the old fashioned green cards because they are electronic, and easily stored as an Adobe PDF file. Electronic PDF files are more convenient to manage for many mailers. Unlike green cards, you can’t misplace an electronic record. Electronic Return Receipts also stored inside your Certified Mail® Labels account for 10 years. How Can I print Electronic Return Receipts? Yes. Online service keep a copy of your transaction and delivery records for 10 years. You will have proof of mailing, in-route tracking and the final proof of delivery as evidence for each letter you mail. 3. Click on Reports, then Summary Tracking. Seach by using the date, name, your reference information etc. 4. View the USPS letter tracking or print a copy by clicking either report link or the Detail record view. What receipts are provided using Certified Mail Envelopes service? Two receipts are provided with Certified Mail Envelopes. The first receipt is the proof of mailing PS-3877 manifest or firm sheet. This provides you with a record that your letter was accepted by U.S. Postal Service. This receipt is available by using our approved USPS Mail Manifest. You can also use the Shipment Confirmation Acceptance Notification (SCAN) form we provide. You can simply drop your letter into any mail box, or give to a Postal Carrier. The date and time USPS accepts your mailing is electronically recorded in the database and is used on all the reports. So, you and skip the trip to the Post Office and still have proof. If you drop your letter into any USPS mail pickup the Electronic Tracking scan will serve as your proof of mailing. Be careful to note the pickup schedule dates and times at local mail drops. The second receipt is proof of delivery or the ERR-Electronic Return Receipt ™. This serves as your proof USPS successfully delivered the Certified letter to the delivery address specified or that the letter was returned to sender. ERR is the Electronic Return Receipt (green card). This report is printed from our web software and is used to provide legal proof of letter delivery. This report shows Certified Mail delivery information. The information is authored by the United States Postal Service. This is a report that can be printed from the web software. The data may also be exported to your local computer or network and kept as a part of your company’s data warehouse. Do I Need a Signature Showing Who Signed For The Certified Mail letter? Signatures displaying who signed or accepted the Certified Mail letter are optional. Check with the laws in your local jurisdiction. Today many laws simply require proof that you mailed the Certified Mail letter and it was delivered. Certain states like the District of Columbia, Texas, Nevada, and others may require Return Receipt. This is when you can use the electronic Return Receipt USPS PDF and save money. Most people assume they need the optional Return Receipt Signature service with and waste a lot of money buying services they never use or need. What Happens if USPS Cannot Provide Me Proof Of Letter Delivery? If you mailed a Certified Mail letter and your letter has not been delivered after 30 days you should request a refund since the Certified Mail Special service was not preformed. We understand the refund may not be what’s important – but by requesting a ‘Refund for Postage’ it causes an internal review as to why the Certified Mail service was not performed. We know many local Postmasters don’t like reviews or headquarters asking questions so they will work extra hard to help you get your issue resolved. If needed, request PS-Form 3533 the Application and Voucher for Refund of Postage and Services. If you continue to have problems, customers have found reporting the delivery problems directly to USPS Headquarters in Washington, DC. helpful. Ask for Special Services or the Postmaster General at Headquarters. How Can I track my Certified Mail Envelope? In-route each letter’s delivery can be tracked with the patented Electronic Tracking Confirmation (ETC) service that is provided inside each Certified Mail Envelope. The electronic tracking process provides in-route tracking, plus the final proof of delivery recorded by the U.S. Postal Service. Remember the day when letters were sorted manually, some of you may even remember Western Union and the telegraph or wire. Today we live within technologies like the iPhone and iPad that have caused a sea of change. Many people will have a difficult time understanding the ‘Old School’ or message and mail delivery methods of yesterday. Today USPS is a government owned and run agency in the United States responsible for delivering mail. USPS is among the earliest Government run businesses based in Washington, D.C. and retains what some consider a monopoly when delivering letters and messages to your mail box. Through USPS, people may send letters, packages, Certified Mail, and business letters to almost any delivery address in the United States. Recently you may have noticed a new bar code appearing on the face of your letter or parcel. It is called the Intelligent Mail Barcode, popularly known as IMB is really a brand new tracking and automated process to assist that can be used to help soft and track USPS Mail. It combines older Planet Signal barcodes and the POSTNET barcode into 1 unique type of barcode capable of providing more information. Numerous USPS IMB bar codes were used to identify a variety USPS products and services like First Class, Certified Mail, Certified Mail Electronic Return Receipt, Certified Mail Restricted Delivery, Priority Mail, Express Mail, Media Mail, Third Class and others. The bar codes assist USPS understand the services related to each product line and the delivery importance they provide. Certified Mail Envelopes provides the web site and online process to address and track USPS Certified Mail with Electronic Return Receipt and proof of mailing and proof of letter delivery. This process is an example of how Intelligent Mail Barcodes are used on the USPS Certified Mail letters. The new Intelligent Mail Barcodes are effective to provide entry and in-route letter tracking scans from the United States Postal Service mailings. It is ideally suited for business required to complete compliance mailings and provide proof or mailing, track letter deliveries and is even used to confirm delivery and used by telephone call center operators to assist customers with support or assistance. Companies like Certified Mail Envelopes, Inc. can provide turn-key solutions for in-house mailers, letter shops, law firms, financial service companies and others. Another option is to use Send Certified Mail; they provide same day printing and mailing of compliance letters fast, easy. They also use the new Intelligent Mail Barcode for inbound letters that USPS cannot deliver for a variety of reasons. Many are marked Undelivered, Return To Sender, or Refused. Send Certified Mail electronically scans the exterior of the envelope when it is returned and provides their clients with an electronic log showing the USPS acceptance, in-route delivery tracking, attempted USPS delivery scans and then the Return To Sender or ‘Refused’ message from each mailing. Today many companies have increased USPS Certified Mail processing and storing the records electronically is not only a Green thing to do, it just makes good business sense. Purchasing automated USPS Certified Mail supplies or outsourcing your USPS Compliance letter printing to a specialty supplier can save your company time and money. Additional benefits include faster letter deliver due to the automated preparation and Intelligent Mail Barcodes used by the Post Office to deliver your letters. Additionally, outsourcing permits your staff to reduce in-house work loads. To learn more about automating your USPS Certified Mail with Return Receipt Requested and Signatures contact Certified Mail Envelopes or Send Certified Mail. These are two companies that can help you automate your next compliance or Certified Mail project. Everything you need to send USPS Certified Mail including Intelligent Mail Barcode, online web software access, CASS, entry paperwork, postage calculator, batch address list upload, Electronic letter tracking, Electronic Return Receipt, USPS Signature PDF’s and long term storage (7 years) of your records is available. The paperless office, this idea and concept has been around for years but getting the concept to apply to USPS Certified Mail may be another thing. The Paperless Office concept has been around for years but getting the concept to actually stick is another thing. Many offices are filled with high speed copiers, printers and fax machines, and yes that friendly USPS letter carrier continues to bring us more paper each day. It seams impossible to be entirely paperless in todays workplace. I am frequently asked by prospective clients how they can eliminate those old fashioned Green Cards and still have the legal proof their Certified letter was delivered. This is when I introduce them to the Electronic Return Receipt that is included with each of our Certified Mail Envelopes. It allows you to access your mailing, in-route tracking and Certified Letter delivery tracking information electronically through our online web based Certified Mail Electronic Tracking & Delivery Confirmation (ETC) service. You can access 24/7 all of your Certified Mail tracking and delivery history for 7 years. Print what you need when you need it. No more lost green cards. You no longer need to bury yourself under a mountain of USPS green card papers and forms . Instead each letter and print the Electronic proof of mailing or delivery confirmation and Signatures records recorded by USPS on demand. Our web based Certified Mail Envelopes automation provides you ‘custom search fields’ to quick track and print your data. Use a custom account number, reference ID or unique ID to quickly find each letter. This links your USPS Certified Mail letter with your unique customer information and can help you find information quickly – on demand. When you are ready to track your letters, just use the search box in our web software to see your letter has been delivered by USPS or if perhaps it has been refused. • Saves time and money on the cost of paper, printing, print cartridges. • Unlike paper records, electronic records can’t be misplaced in the mail stream and lost. Myrna Brown is President of Certified Mail Envelopes, Inc. a company that specializes in compliance mailings and automated USPS Certified Mail solutions. 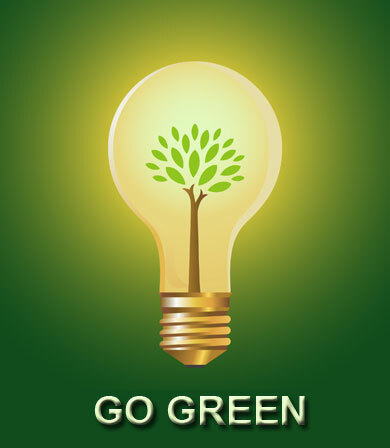 To learn more about automating your compliance letters, and ’Going Green’ with USPS Certified Mail call us. 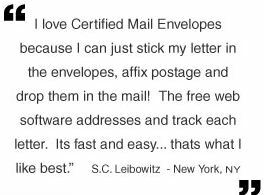 Or sign up for the ‘free trial’ at Certified Mail Envelopes and Go-Green. No more stickers, forms or labels! Address your USPS Certified Mail® online with Electronic Delivery Confirmation sent by Email or Return Receipt Electronic Signatures. Savings up to $2.05 postage per mailing! Get USPS proof of mailing, in route letter tracking and proof of delivery for each letter. 24/7 online access, 10 year data retention and off site storage. Sign-up now and get 2 of our USPS approved Certified Mail® Envelopes with Electronic Return Receipt to try for FREE! You will still be responsible for paying USPS Certified Mail® postage plus First Class postage. You can save the $2.80 Green Card fee by using our Electronic Delivery Confirmation or Electronic Return Receipt Signature that provides USPS proof of delivery. • Off-site record keeping in our secure data vault for 7 years. Rest Easy - Your compliance receipts are safe, secure and easy to find. No bank card or credit card is needed. Sign-up to get your Free Trial Envelopes that will arrive in 4 to 5 days. If you need to mail a Certified Mail® letter today – upload your letter to Send Certified Mail and we will print and mail your letter the same business day. Each USPS Certified Mail® Envelope includes USPS our Electronic Return Receipt with letter tracking and daily in-route delivery updates and the final USPS delivery confirmation. Print Electronic Return Receipts to show USPS proof your letter was delivery. The manifest or firm sheet is used to show your letter was accepted by the United States Postal Service (USPS). It is your receipt of mailing or acceptance showing you entered the letter into the mail stream. Our software prints a USPS Mail Manifest Form 3877. If you take your mail to a Post Office the clerk will stamp the report with the round USPS date stamp. Or you can skip the trip to the Post Office by using our USPS Electronic manifest acceptance date scan. You also get in-route tracking and final delivery scans to show your complete letters DNA and acceptance in-route tracking and the final proof of delivery by the Postal Service. • No peel and stick labels to match up: Eliminates hand affixing and errors. 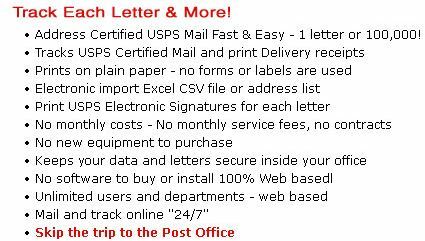 • How much does it cost to send Certified Mail®? • How long does it take for USPS for a Certified Letter to be delivered? • Who do I call to track my letter? • What is Electronic Return Receipt ERR? • Where is the Green Card? The USPS Certified Mail® rate is $3.30. You also need to apply First Class postage (1 OZ) $0.47. If you are using the old fashioned Green Card Return Receipt you would need to add an additional $2.70 postage. Your total cost would be $6.47 to mail a 1 OZ letter. If you use our system, your total cost per letter for Certified with Electronic Delivery Confirmation is $4.52. How long does it take for USPS for a Certified Letter to be delivered? Plan on 3 to 5 business days, unless you are sending it by Priority Mail or Express mail service. USPS does not guarantee or specify an exact delivery time. A USPS Certified Mail® is First Class mail and is considered Special Service mail that receives high priority delivery service. At each delivery address someone must be available to sign for the USPS Certified letter. If you are mailing to a residential address and no one is home, a delivery reminder slip is to be left in the mailbox by the letter carrier. This reminder informs the person a USPS Certified Mail® letter is being held at the local Post Office for pick-up. They must go to the Post Office to Sign for the letter and pick it up. If no one picks up the letter after 5 to 7 days, USPS attempts a second delivery. Again USPS will leave behind a delivery slip reminder by the letter carrier. Finally after 10 to 12 days the third and final delivery attempt is made to the delivery address. After the final notice reminder is left the letter is taken back to the Post Office and held for 5 to 7 additional days. This entire time frame can take 17 to 21 days if no one has claimed the letter. USPS then marks the letter ‘Unclaimed’ and the letter is returned to the sender. • Who do I call if I have questions about USPS letter delivery? The USPS Help Line is 800-275-8777. You can visit the USPS web site www.usps.com. Remember USPS does not provide ‘in-route’ letter tracking for Certified Mail®. You will not get updated delivery information until the USPS letter carrier has attempted to deliver the letter and scanned the letter. If it has been more than 3 weeks and you see no attempted delivery information reported the best place to call is the local USPS Post Office responsible for the letters final delivery. In other words, the Post Office closest to the final delivery Zip Code. To locate this information call USPS and request the name of the Post Office responsible for mail delivery at the final delivery address you may need to provide them the Zip Code. Yes. You can mail a USPS Certified Mail® letter to a P.O. Box in the United States. Certified Mail® letters are addressed and delivered to the PO Box with no changes in mailers process. You address the letter using the PO Box instead of the street delivery address. When the letter carrier delivers the letter the process to document when the letter was received is a little bit different. A delivery notification card is placed inside the PO Box instructing the recipient to pick up the Certified Mail® letter at the window. A Post Office window clerk is then presented the delivery confirmation Signature card and the date and time of the delivery confirmation are electronically captured and recorded by USPS. This is how the United States Postal Service handles delivery confirmation when you send Certified Mail® to a PO Box. • Can I send a Certified Mail letter to Canada? No. Certified Mail is a product of the United States Postal service and Certified Mail® is not available in Canada. Most mailers use Registered Mail. • What Happen To The ‘Green’ Return Receipt Cards? The Green Card Return Receipt has been the icon of Certified Mail® for many years. This little Green Card has been difficult for both the sender and the U.S. Postal Service to manage and store. In July 2001, the U.S. Postal Service began providing Electronic delivery confirmation available in a PDF file that provides proof of letter delivery. This information is collected and authored by The United States Postal Service USPS and provides the sender ‘proof of letter delivery’ for USPS Certified Mail®. Electronic Return Receipt ERR™ provides USPS delivery confirmation for USPS Certified Mail® delivery by the United States Postal Service. Many mailers are using the Electronic Return Receipt ERR™ to quickly replace the old fashioned green cards because it is electronic, produced in Adobe PDF format and the information is authored by the United States Postal Service. This is more convenient to manage for many mailers. Unlike green cards, you can’t lose an electronic record. Electronic Return Receipts also link to the original Signature image record that is stored at USPS when the letter was delivered by the letter carrier. • What receipts are provided using Certified-Mail-Envelopes service? Two receipts are provided with Certified-Mail-Envelopes. The first receipt is the proof of mailing PS-3877 manifest or firm sheet. This provides you with a record that your letter was accepted by USPS. This receipt is available by using our approved USPS Mail Manifest. We suggest you have this sheet signed and dated when you turn your mail over to the Postal Service. If you drop your letter into any USPS mail pickup the Electronic Tracking scan will serve as your proof of mailing. Be careful to note the pickup schedule dates and times at local mail drops. The second receipt is proof of delivery or the Electronic Return Receipt ERR(TM). This serves as your proof USPS successfully delivered the certified letter to the delivery address specified or that the letter was returned to sender. ERR (TM) is the Electronic Return Receipt (Green Card). This report is printed from our web software and is used to provide legal proof of letter delivery. This report shows Certified Mail® delivery information. The information is authored by the United States Postal Service. This is a report that can be printed from the web software. The data may also be exported to your local computer or network and kept as a part of your company’s data warehouse. • What if we need a Signature from the person that signed for the letter? 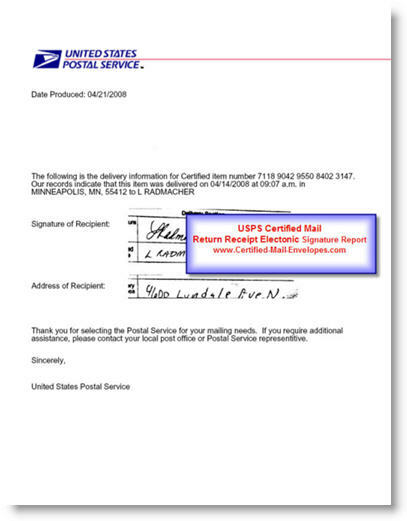 Signatures displaying who signed or accepted the Certified Mail® letter are electronically collected and stored by USPS. We are not aware of laws requiring mailers display the proof of the actual Signature, only proof that the USPS Certified Mail letter was mailed and proof the certified letter was delivered. Most people confuse Signature service with Registered Mail or Restricted Delivery and waste a lot of money buying something they don’t need. If you ever need the U.S. Postal Service to provide a copy of the actual image of the signature you must purchase this when you are creating your label. The USPS no longer has the service available to purchase the signature after the delivery. • What Happens if USPS Cannot Provide Me Proof of Letter Delivery? If you mailed a Certified Mail® letter and your letter has not been delivered after 30 days you should request assistance from the Post Office. They are able to internally communicate with the Post Office responsible for delivery. You can also request a refund because the Certified Mail® special service was not properly administered. We understand the refund is not what’s important – but when you request a ‘Refund for Postage’ it causes an internal review as to why the refund is granted and more important why the Certified Mail® letter service was not performed. Postmasters and headquarters don’t like refunding money we find they will do all they can to help you find your lost letter and this issue resolved. To begin a refund request from USPS use PS-Form 3533 the Application and Voucher for Refund of Postage and Services. If you continue to have problems, customers have found reporting the problem directly to USPS Headquarters in Washington, DC. very helpful. They conduct regional training with the letter carriers and will work to improve service in your area. Call USPS Special Services or the Postmaster General at Headquarters.